This would be perfect for a show picture or collage. 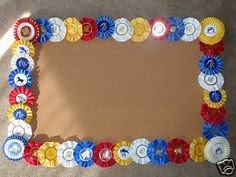 It could be done with just 2 ribbons for a small photo, or dozens to surround a large mirror or bulletin board. You could also find a unique frame and just hang them up! It doesn’t get easier than this! I love the simplicity and the ribbons could be easily rearranged to match your decor or the seasons. A red & green ribbon wreath would be an obvious choice for the holidays, but a variety of colors is perfect for year-round use. 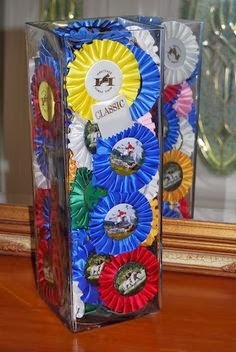 I really like the idea of leaving a few special ribbons intact at the bottom. This would be great tack room decor! If you have a knack for sewing, this is a beautiful way to display your ribbons. This pillow and quilt is from Distinctive Designs by Diana and is a nice alternative to making your own if you’re not so savvy with this type of project (like me!). Or you could pin ribbons to a pillow for a simpler look. Turn your ribbons into a fashionable clutch, like this one by Tracy Michele Designs (she also does cute tote bags). I would love to have one in all red to go with my favorite little back dress. You could also add a ribbon to a clutch or purse you already have for a totally unique look. 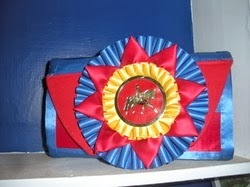 How do you use your old Horse Show Ribbons?